I think I’m suffering from vacation depression. I miss my morning contemplations on the balcony, sipping coffee and staring deep into the turquoise water; should we make a change? Live the slow life? I could get used to wind swept hair and no make up. I like the heat. And I have zero problem swapping out leggings and Old Navy zip-ups for a beachy maxi-dress. Because I can’t drink margaritas all day, I’ve resorted to food. 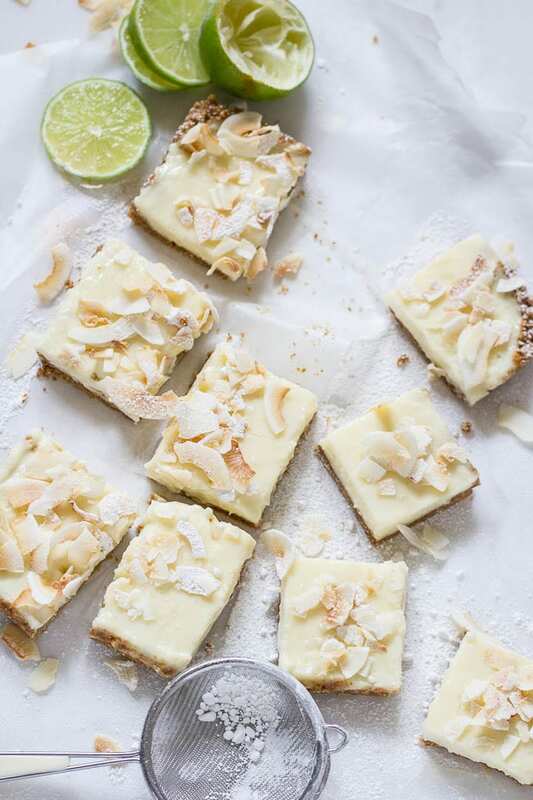 Current cure: lightened up key lime bars. I’m no stranger to the key lime pie. It’s my favorite dessert. A traditional key lime pie is made with sweetened condensed milk, egg yolks and fresh key lime juice. The filling is poured into a graham cracker crust, baked and chilled overnight. The following day, you have the most delicious dessert. It’s usually garnished with whipped cream and sprinkles of lime zest. Sometimes, it’s even served frozen. Until now, I’ve failed to share a recipe. My original version is an absolute pain to make. It’s way too detailed. There are too many steps. It’s full on fat. And speaking of, since I ate my weight in key lime pie on this trip, I’ve become obsessed. I wanted to create a lighter version similar to the original, but with half the calories (and steps). Condensed milk is cow’s milk without the water. It’s cooked down with sugar until thick and creamy (think pale yellow glue). It’s used as a base for a variety of desserts and pies, including ice cream for its velvety rich texture. It’s funny, because my husband absolutely loves condensed milk. He used to eat it out of the can when he was a kid (still does!). This sweet treat packs some serious calories; almost 1,000 per can with 166 grams of sugar! Finding a key lime is like looking for a pen at the bottom of your purse. And when you do find them, they’re so small you have to juice a million of those things to equal only 1/2 cup. I’m not a fan of store-bought crusts. Convenient, yes. Real ingredients? Sometimes. Plus, they’re way overpriced. I can get 2 boxes of all-natural graham crackers for the price of one pie shell. My kids eat whatever’s leftover as snacks. Once upon a time I created this recipe. And I borrowed its ingredients to perfect my key lime bars. Aha! I completely eliminated condensed milk. It’s just way too sweet for me- one bite and my brain starts to buzz! Instead, I used a lightened up pastry cream for my filling (think éclairs). Mine consists of milk, whole eggs, sugar and fresh lime juice. Gelatin is added to help it set, making it easy to cut into squares. The filling is perfectly creamy and not rubbery at all. It is 100% OK to ditch the key limes. Just use normal limes from the grocery store. I would advise buying more than you think; limes don’t seem to be very juicy these days. I made my own using real ingredients. I blitzed graham crackers with unsweetened coconut flakes, cinnamon and dates in the food processor. The dates naturally sweeten the crust without any added sugar. They also help to bind the mixture together without butter. The crumbs resemble wet sand and are easily pressed down into the pan to create a humble homemade crust. I think so! The texture is pleasantly creamy, it’s not too sweet, and I don’t feel like I’m going to pass out after taking a bite. There’s still a couple of steps involved but it’s not as intense as the original. I should also mention that this is a no-bake recipe. Because the pastry cream is cooked on the stove, there’s no need to bake it again in the oven. Just pour the filling into the crust and refrigerate overnight for it to set nicely. This is excellent for entertaining. To serve, I garnish the top with toasted coconut flakes to echo the flavor in the crust and finish it off with a dusting of powdered sugar. Cut into squares and serve! 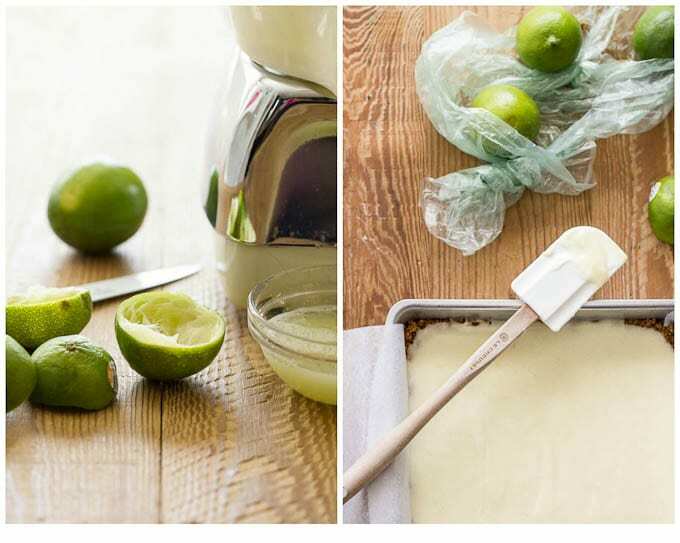 One quick note: you can’t freeze these key lime bars. There’s a little bit of cornstarch in the pastry cream and cornstarch breaks down when frozen. Keep refrigerated. Grab an 8x8 inch pan. Line it with parchment paper leaving extra to hang over the sides for easy removal. To make the crust, soften your dates. If they look a bit dry and crystalized, soak in warm water to reconstitute. Remove the pits. 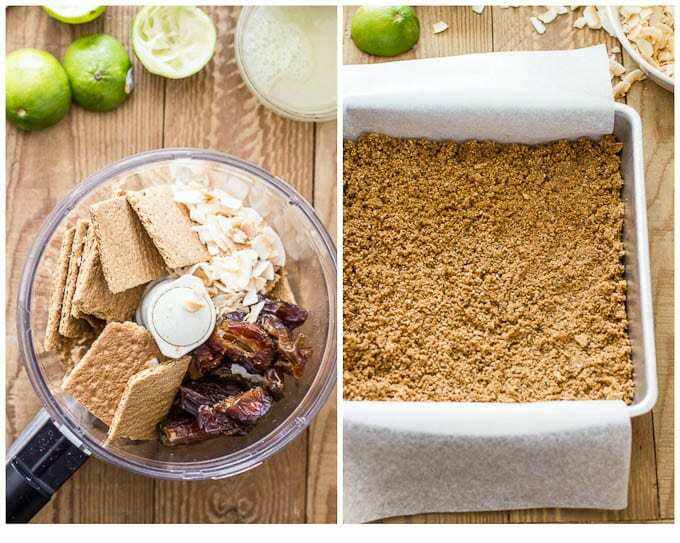 In a food processor, add the graham crackers, coconut flakes, dates, cinnamon and coconut oil. Process until the mixture resembles wet sand. It should look crumbly but come together when pressed in your hands. If not, add a tiny bit of water to get it going. Then, press the crumbs down into your lined pan to make your crust. For the pastry cream, place the gelatin and a splash of water in a small bowl. Mix well and set aside. Juice the limes. An electric juicer or citrus reamer works really well. Set aside. Bring the milk to a gentle boil. Remove from the heat. In a large bowl, whisk the eggs, sugar, and cornstarch until well combined. To temper the eggs, slowly whisk about ½ cup of the warm milk into the egg mixture, stirring constantly (do not pour all at once or else the eggs will scramble). Pour the tempered egg mixture back into the pan of milk. Add the gelatin and lime juice. Increase the heat to medium-low, and cook stirring constantly with a wooden spoon until it has thickened, about 1-3 minutes . Strain the mixture through a fine sieve directly over your prepared crust. Smooth out the top with a rubber spatula. Cover with plastic wrap (touching the surface of the pastry cream) so that it does not form a skin. Leave to cool at room temperature for an hour and then transfer to the fridge to chill overnight. When ready to serve, remove the plastic wrap. Then remove the the pie from the pan. 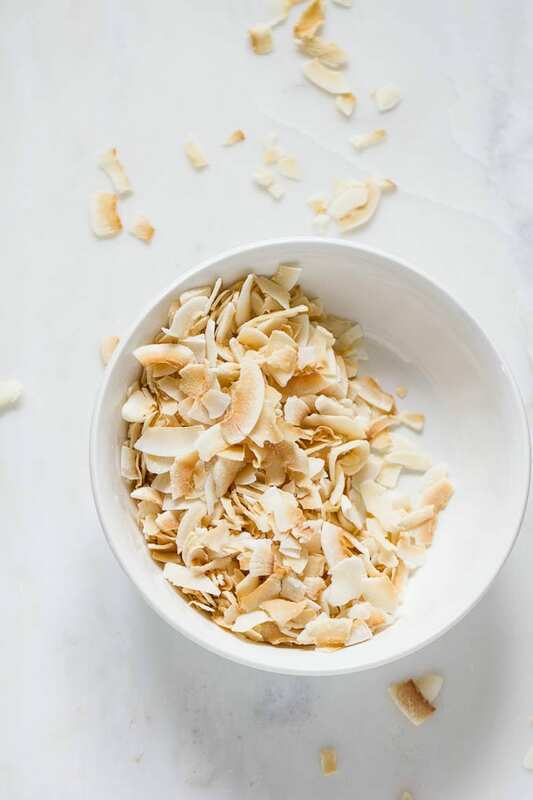 Garnish with toasted coconut flakes and powdered sugar. These look yummy. I look forward to trying the recipe. Any suggestions for substituting the coconut? We have food allergy issues. Have fun with the recipe! This looks delicious! I was never a fan of condensed milk. Can’t wait to try! I’m inspired by your photos and look forward to spring and summer! Love the shot of the boys! Thanks so much! Yeah, condensed milk is a tricky one… even if you are OK with using it, it seems to be one of those ingredients you never have. This version is a little more user friendly (minus the powdered gelatin- ha!). I have to ask where do you vacation? 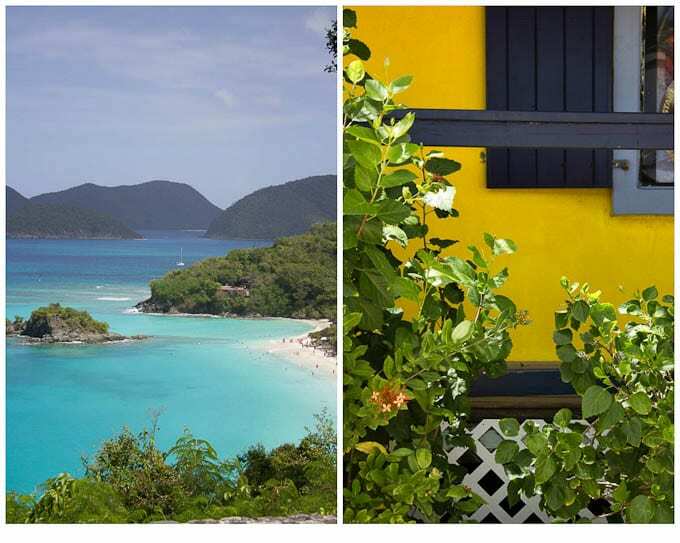 We saill the British Virgin Islands and it looks very familiar! Don’t you just wish we could all live there is such beauty! Do you have any recommendations for next time? I was absolutely blown away by the natural beauty. It was incredible. And yes! I could live there for sure. Ooh it looks like you had such a fantastic vacation! 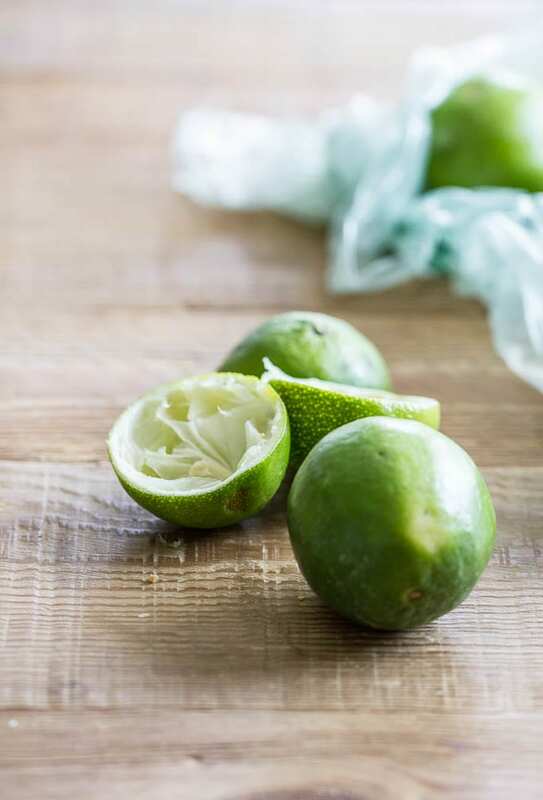 And I absolutely LOVE key lime pie – my father used to bring home one that was super rich, and inevitably I would eat half the enormous thing (a bite here and there, during frequent trips to the kitchen). Since becoming gluten/dairy free, the closest I’ve had was a cashew-based lime cheesecake (also amazing), but these bars just look so fantastic and I’m sure full-fat coconut milk would sub in well for the whole milk! Thank you! We did, it was so much fun and very relaxing (ocean waves put me to sleep). Yes! The cashew based lime pie/cheesecake is delicious as well. In fact, I make that for Dillon as an afternoon snack. I keep it in the freezer. He loves it. It’s so funny you mention coconut milk- I was thinking about that for this, but then I wanted to keep it as close the original as possible. Must try next time! i like that theyre lightened but you wouldnt guess it ;) HAPPY ST.PATTY’S DAY TO YOU! Ahh… so true! I make a good pastry cream without the cream ;) Thanks Kelsey! Lovely! It’s always the sweetened condensed milk (and raw eggs) that put me off key lime pie. Thank you for this perfect version!! Those lightened up version of key lime pies sounds genius! They look heavenly! Thank you for sharing this recipe! What a beautiful, sunny trip you had, Emilie! 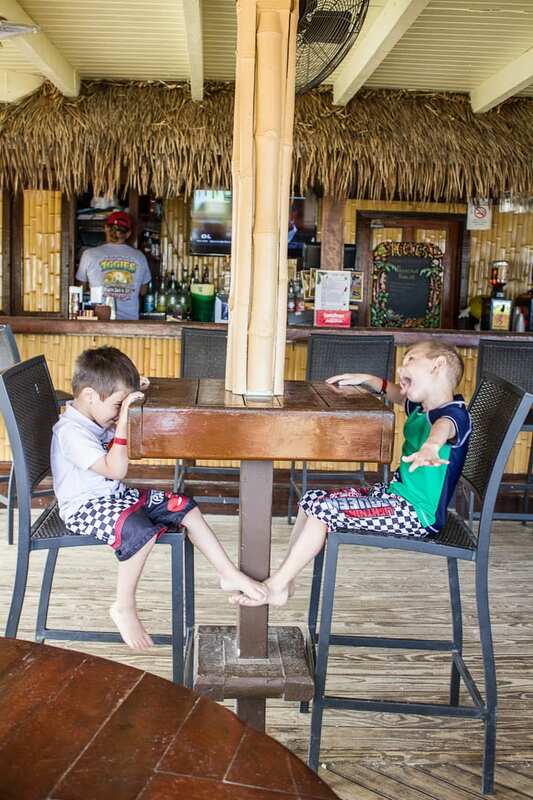 And look at those two crazy boys, hammin in up under the hut! 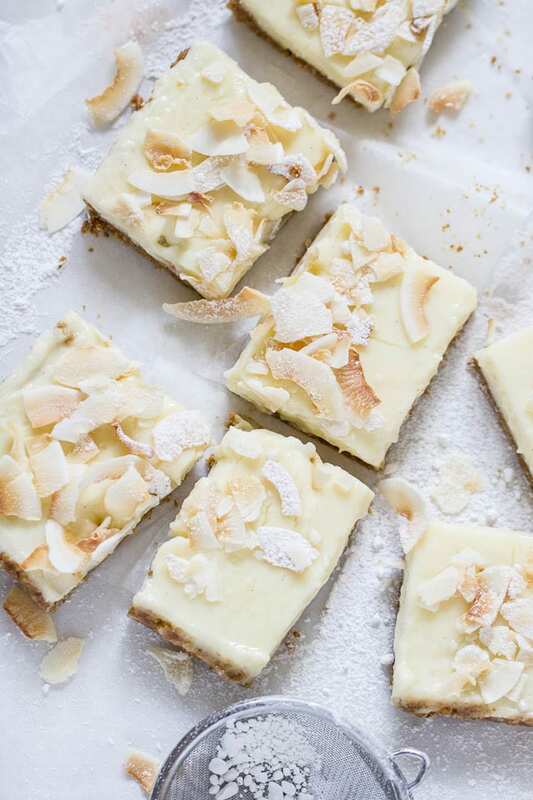 I’d trade my sweatshirts and yoga pants for a flowy maxi skirt… um humm… and your lightened up key lime bars! I grew up on SCM… oh my goodness the stuff flowed at every holiday and I loved it as a kid! But haven’t used it in soooo long. Thank you for all your helpful tips! I’m diggin that crust, so simple and sweet! Yesssss! I’m guessing SCM is sweetened condensed milk…. Love finding this recipe–looks like a winner to me, can’t wait to make it! All the things that I love about key lime pie, but easier, and healthier! Win Win! The only good part about not being on vacation is day dreaming about it. Looks like you guys dug the real stuff, and morphed in easily. No bake desserts are the best and I agree, those dastardly key limes are a pain, thanks for the alternative. I’m so in love with key lime pie so I have to try this! Thank you so much! Oh, yes- lightened up desserts that are not too much of a departure from the original are fun to create (and eat!). I absolutely adore key lime pie. These bars are truly genius. I have never had key lime bars, but I think I might just have to start with these. Gorgeous photos from your trip too. I was just in Hawaii not long ago and I am seriously missing my early morning walks on the beach. Brilliant! I love how you’ve changed up a well-loved recipe to make it easier and a bit healthier, too! And since I’m a HUGE key lime pie fan, I can see these bars being made in our kitchen sometime super soon! Thanks for sharing! Thank you so much. I’ve been making key lime pie for years; my most requested dessert. But I really, really wanted to see if I could lighten it up without departing too much from the original. Oftentimes I find that’s the problem. New and improved versions are their own thing! Theses bars were a lovely sweet, creamy, tangy alternative. 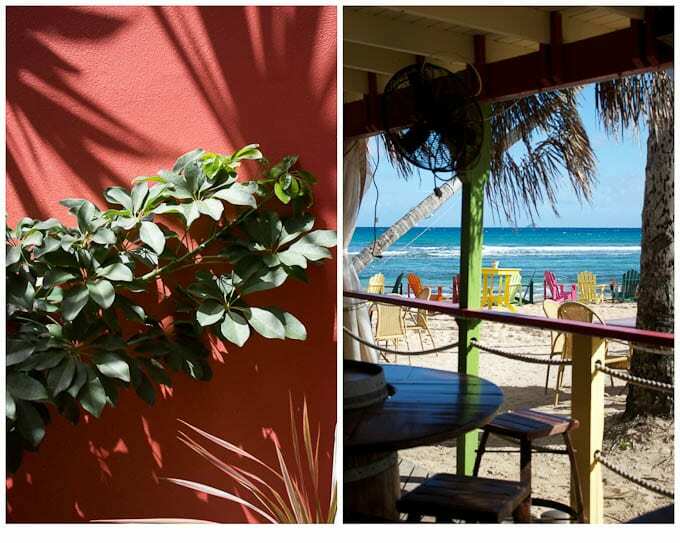 This all sounds divine, and I love seeing your vacation pix. I am with you on the condensed milk. For almost all uses it is just WAY too sweet, as in verging on brutally so. I LOVE your idea of using dates in the base. That is just brilliant, and I must give it a go. Your lime bars sound wonderful. Also – I’m with you on the topic of the key limes. As you say, when one CAN find them, one must buy a bushel Give me a break. I am fortunate, I have a Bearss lime tree in my yard. The little dwarf tree is remarkably prolific, and the limes are so wonderfully juicy. Sometimes we home gardeners really luck out. Ah, the vacation was wonderful, Adri. I could’ve stayed put for a month. Easily. These look amazing. I love your description of the problems and solutions. Looking forward to trying these out. Hey Emilie! I’ve always had it on my to-do list to make key lime pie one day, but the idea of condensed milk kind of turns me off because it’s too sweet and one of my new year resolutions is to cut down on processed foods and sugars. So yours seems like a great alternative! Thanks for sharing your recipe! What a wonderful way to cut out condensed milk! What is the function of the corn starch in the pastry cream? Could powdered milk be substituted so that these can be frozen? The function of the cornstarch is to thicken the pastry cream. Powdered milk would not be the same. I’ve heard that flour in pastry cream freezes well but I have not tried this myself. If you experiment, let me know! I’m going to make these for my dad’s upcoming 70th birthday. He LOVES key lime pie and this looks so pretty and fresh and different! I love this recipe!! It’s my second time making them in 2 weeks! I substituted milk for a can of coconut milk and it’s perfectly creamy and delicious. Thanks for the recipe. I love the key lime recipe! I changed the crust to gluten free with ground almonds.